So, you’re expecting a baby. Congratulations! You are probably very excited about everything that’s to come. However, you may also be nervous about several challenges, particularly if you’re already the parent of a loving pup. New parents might feel nervous about introducing their baby to a dog that’s already in their lives. This nervousness is warranted, since a new baby presents many changes for a dog; maybe the dog is used to being the baby of the family and will be mad or sad about losing attention. Alternatively, you might feel nervous that your dog thinks the baby is a toy and plays too rough with her. Also, your dog may feel overwhelmed by all of the new sights and smells surrounding the baby, as well as the shift in schedule. However, if you’re a new parent who worries that their fur baby and their real baby will never bond, you’re in luck. You can take some simple steps to introduce your baby to your dog in a way that helps them bond and is safe for the baby. There are also some great ways to ensure that the baby and dog do bond and love each other. Here are some of the best and most helpful for you to try. A dog’s routine (like yours) will change when you bring a newborn baby home. Slowly start shifting his routine to be like his new one. Maybe he’ll have to go out for walks much earlier in the morning and go to bed much earlier in the evening. Or maybe he’ll have to wait to be fed until the baby is nursed. Try to gradually shift your dog’s routine by a half-hour over the weeks and months before your baby arrives so the new arrival is not a shock to your dog’s system. Dogs get to know the world by scents. Introduce your dog to baby scents to get him ready for all the new smells that are going to be in the house. Have him smell baby powder, baby foods, lotions, shampoos and so on. Once your baby is born, bring an item of clothing or a soft toy home that has your baby’s scent on it. Get your dog used to the scent so that your baby smells familiar to him when they’re finally in the same room. For a few days after you bring home the new baby, keep the dog away from the baby. You may have to use baby gates or keep doors closed for this period. Just remember — this part is only temporary. Once the dog is used to hearing and seeing the baby, let him slowly approach her while using a leash. 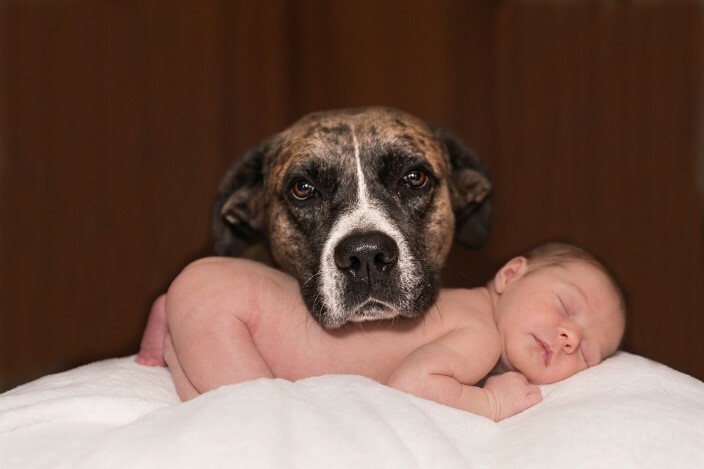 Your dog should get a chance to smell the baby, and you should praise him while he does. Make sure your dog is willing to approach the baby; don’t bring the baby to his face. Dogs that are excited to see what the baby is all about won’t feel imposed upon or threatened. Once your dog has gotten used to your baby’s smell while on the leash (after a few days), let him off the leash around the baby. Your dog might think he has a chance to play rough or interact differently with the baby. Make sure you stand close by to intervene, and keep the baby elevated and in your arms while the dog sniffs her out. Give your dog praise as he sniffs the baby and is gentle so he understands that’s the correct way to behave. Don’t make your dog feel left out around the baby or when the baby’s not around. This can lead to resentment on the part of the dog. Pet and talk to your dog while you’re spending time with the baby. Continue to get the dog new toys as well, so the dog feels included in this whole “new” process. Also, don’t get mad at your dog for picking up the baby’s toys. Instead, simply replace the toy with one of his own; your pup doesn’t yet understand that not all toys in the house are for him. Don’t forget to give your dog routine care, like taking him to his vet or grooming appointments and getting regular treatments such as Nexgard, which can keep ticks and fleas at bay. Ultimately, having a human baby is exciting and fulfilling, and so is having a fur baby. Having both is definitely an option that’s feasible, and when done right, can bring extreme joy and contentment to all members of the family (furry and otherwise). Take some steps at the beginning of your newborn’s time at home to get your pup acquainted, and you’ll have a bond and relationship that lasts a lifetime. These are great tips! One of my dogs was nervous around children before I had kids. She was super curious when we brought the baby home. I think it would be great to have someone take a dog for long walks when a new baby comes home, but I didn’t think of it back then. She seemed to love my kids and was very gentle around them. Of course, I was very cautious and never left them unsupervised! It sounds like you handled it perfectly. I’m so glad they’ve bonded! It’s so important to help your fur children get comfortable and feel safe around human children. Great tips for those potential and new parents. Great post. Our next door neighbors just had their first baby and they have three dogs, so I wonder how their introductions went. It is important to make your dog feel that they are still important. Of course the dog will love the baby once he starts feeding himself and dropping lots of food on the floor! You’re so right about making sure your dog feels special, too, when the baby comes home. And I hadn’t thought about the dropped food aspect of it – I guess that’s why Soldier loves following our granddaughter around – she’s a toddler and usually has a cookie in her hand! Such good tips. My dog Cookie and my older daughter got a little jealous when my younger daughter arrived. We had to give both extra attention and actually ended up adopting a stray puppy that was left on our doorstep that Cookie thought was her baby and she was much happier. What a happy accident that Cookie got her own “baby” to care of. How sweet she is, to mother a stray puppy. Dogs are so awesome! Great article! I was super nonchalant about the bringing home my Babies, and it helped a lot. Keeping things normal, is exactly what kept things…normal! Yes! At the holidays, a new puppy may just beginning to learn the way a household functions when the holidays are over and they have to learn a whole new routine. Who needs to do that twice?